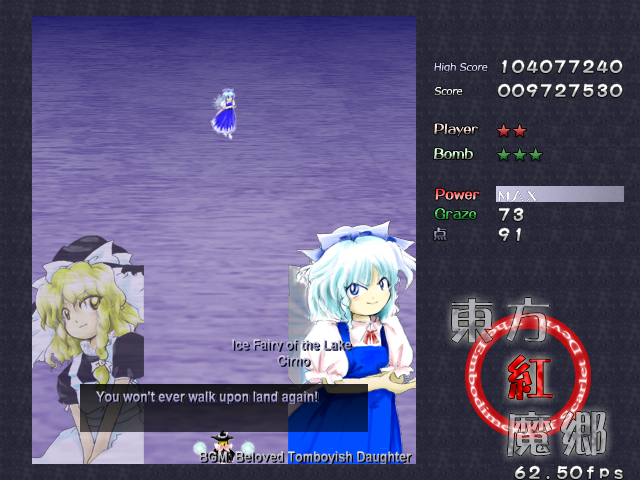 Ok, this is the sixth official touhou game and the first one that was released on the Windows platform. Not only that, the game now introduces new, improvised mechanics and also better audio experience than the previous one. As the player, you can now choose the window size to be in full screen or in windowed 640x480 mode and also BGM format which is in .wav or .midi. The other new mechanics is the focused shooting where the characters can shoot different type of bullets once the player presses shift for slowing the characters movement. Lastly, the item collecting region. Upon getting Full power (by collecting 128 power up piece in total) the character can collect all the point piece, power up piece, bombs and also 1Up piece (if available on screen) just by moving the character to the top of the screen. It is risky to hover to the top of the screen where enemies pop out and also leave the player vulnerable to bullets so pick a good timing to collect. Being too greedy might end up losing one life. 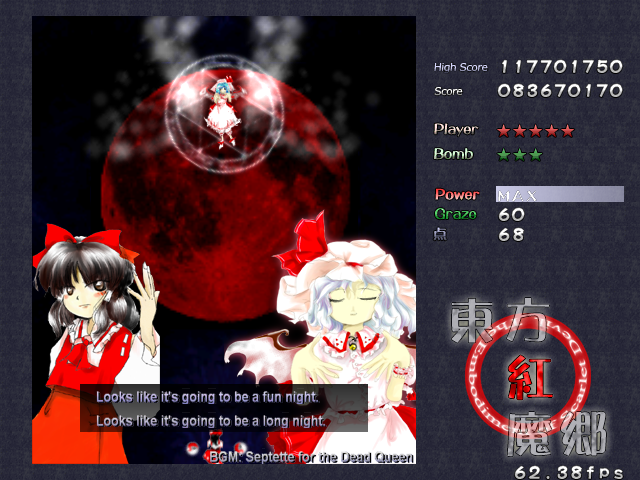 The controls are also the same as most touhou danmaku games but with additional button function which is the "ctrl" button where it freezes the game to 0 fps. Maybe this button is just to allow new players learn the movements and the behavior of the bullet, allowing them to learn to pass through difficult battles. Note that this will affect the score of the game play since there are penalty for slowing down the game. This is because the game has Fps counter on the bottom left of the screen and it starts giving penalty if the game runs below 60 Fps. 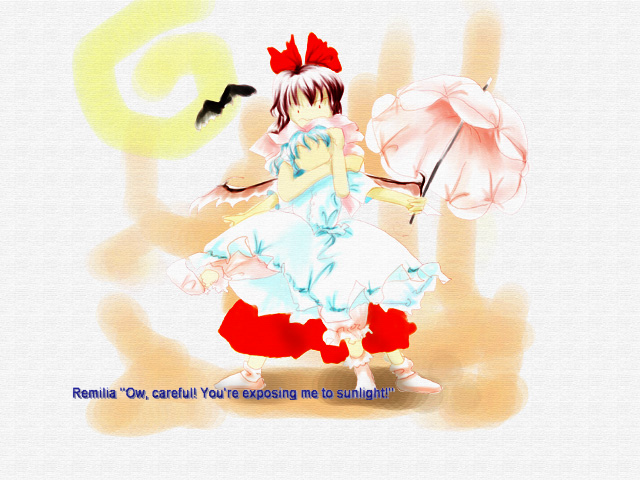 The story is quite simple where Gensokyo is suddenly being enveloped by a red mist (also known as the scarlet mist), blocking the sunlight from reaching the lands. 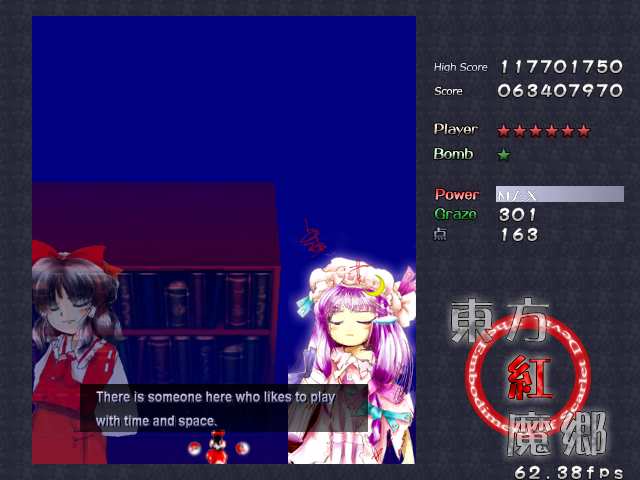 The heroines (Reimu and Marisa) as the playable character will find the source of the anomaly which soon discovers the culprit at the Scarlet Devil Mansion which is a vampire named Remilia Scarlet. Each characters will show different endings so I suggest playing all the routes (though it is rather difficult for new players since the player can only see the good ending on Normal difficulty and above). 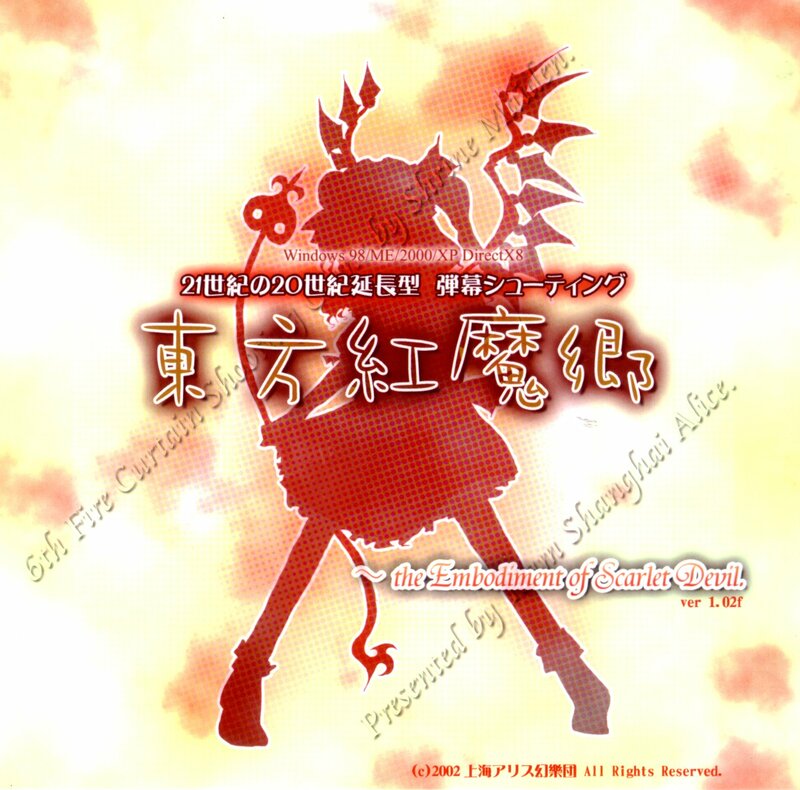 Few days after the event (extra stage), the heroine once again visits the mansion and found out the place is quite... in havoc where the heroine will meet the little sister of Remilia Scarlet, Flandre Scarlet. She was locked up in the mansion for about 495 years and never see human before so it is time for them to play.... a bit. Below are the screenshots and videos of the game play. In my opinion, the game is not that hard. Though bullet density is higher than the previous ones, it is not as fast as before. 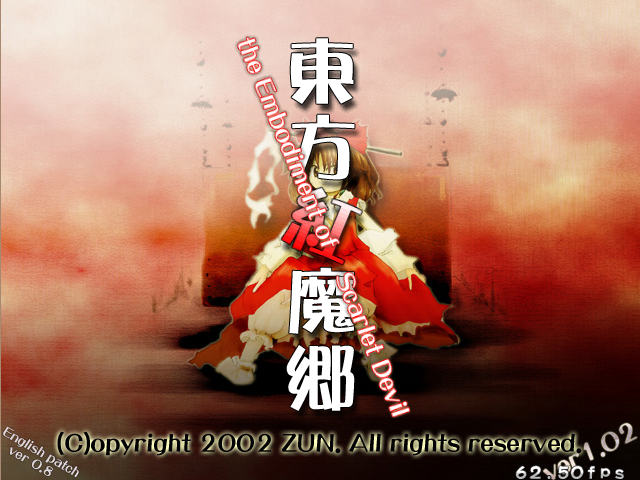 However, for people who wishes to see the good ending, the have to pass through the normal difficulty. That is what makes it hard. I could still remember my early days of playing this game and struggling like hell on easy mode... just to see the bad ending. 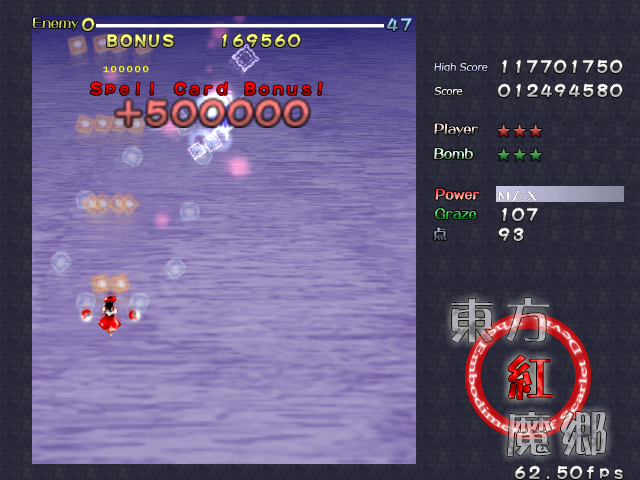 Like all other touhou games, practice and you'll make it. 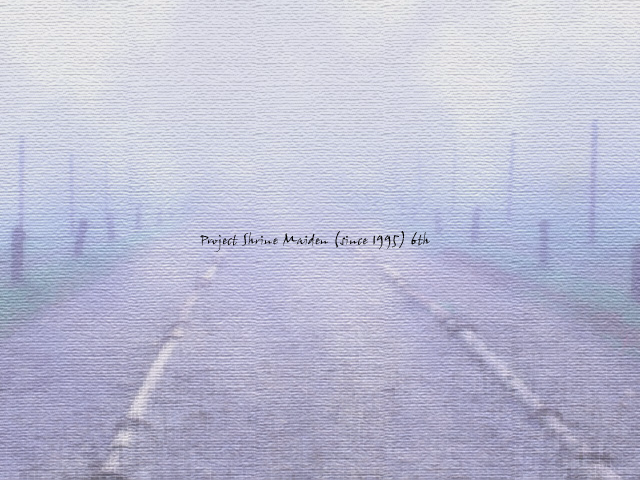 Since it is platformed on windows, after downloading the file, simply extract and play. For mac or linux users, wine could be solution (not verified whether it is able to play all touhou or not) but use it at your own risk.